Updated 5:20 p.m. | In an extraordinary sequence of events, Senate Majority Leader Mitch McConnell offered Democrats exactly what they have been asking for Tuesday — “clean” full-year funding for the Department of Homeland Security. 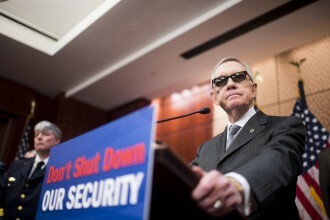 And Minority Leader Harry Reid said "no" — or at least, "not yet." That could lead to the extraordinary circumstance of Democrats blocking a bill they have insisted on for weeks — though a Democratic aide suggested later Tuesday that Democrats might, in the end, agree to McConnell&apos;s proposal, provided the Kentuckian can get Republicans lined up for a unanimous consent request to vote on a clean bill. Boehner isn&apos;t yet on board, with House members scheduled to return late Tuesday for votes and a key Republican Conference meeting still to come Wednesday morning. McConnell has said all along he wanted to avoid shutdowns on his watch. "I do think we have a responsibility to act,” he told reporters. His latest move is contentious among the GOP ranks, with a number of Republican senators backing his gambit, but others, such as Sen. Jeff Sessions of Alabama, continuing to oppose any bill that could allow any funding for Obama’s executive actions to shield some immigrants from deportation. Reid, though, has focused his Democrats on a singular goal — a presidential signature — with debates on immigration and other issues on hold until then. The Nevada Democrat said passing a “hot potato” back over to the House isn’t the goal. It’s getting the department funded. McConnell said he didn’t know what the House would do with a clean bill. And it remains unclear how many House Republicans would be prepared to vote for one and avoid a shutdown. Some Republicans openly doubted such a bill would pass even if Boehner acquiesced, although it wouldn&apos;t require many if Democrats provide enough votes. Sen. Charles E. Schumer of New York, the No. 3 Democrat in that chamber, also said passing a clean funding bill through the Senate won&apos;t get the job done, and tweaked the two top Republican leaders. “Leader McConnell, I would have thought, would have talked to Speaker Boehner before he offered this if he really wants to get Homeland Security funded,” Schumer said. McConnell has spoken with Boehner, but McConnell’s office declined to provide details of their discussions. A Senate GOP aide said it’s up to Democrats when votes would take place on the clean bill and McConnell&apos;s accompanying one to block the president’s efforts, even as a senior House GOP aide criticized Reid for holding out. “Apparently inspired by President Obama’s own over-reach, Sen. Reid is now shamelessly threatening to filibuster a ‘clean’ Homeland Security funding bill. The American people are watching, and there will be consequences for Senate Democrats’ hypocrisy and irresponsibility," the aide said. Even if McConnell, Reid and Boehner are all on board, the deadline before funding expires at the end of the week is so close it will require unanimous consent in the Senate to hold a final vote in time, according to a Democratic aide. That means one hardliner could cause at least a short-term departmental shutdown. Several Senate Republicans, meanwhile, pointed to the injunction by a federal judge in Texas last week blocking the immigration action as reason to pause on shutdown rhetoric. "What the judge in Texas did is victory, frankly, and reaffirmed what we&apos;ve all been saying," said Sen. Jeff Flake of Arizona. "We ought to take the victory and move ahead. ... It&apos;s a way out of a box canyon. But some don&apos;t see it that way." Sen. John Cornyn of Texas, the No. 2 Republican, said the ruling means no funding would go toward the executive actions. The White House, of course, hopes to overturn the injunction on appeal. Humberto Sanchez, Tamar Hallerman and Emma Dumain contributed to this report. Related: McConnell Offers Plan to Break DHS Logjam Hoyer on Short-Term DHS Bill: &apos;Cross That Bridge When We Come to It&apos; Senate Democrats Show Limits of GOP Spending Strategy DOJ to Appeal Immigration Ruling Immigration Ruling Casts Shadow on Obama’s Legacy Reid Allies See Immigration Fight Helping Re-Election Boehner: House Has Done Its Job to Fund DHS White House Thinks GOP Will Blink on Immigration Action Obama: Back Immigration Action Because of Christmas, Bible Obama’s Own Words on Immigration Are Republicans’ Best Ammo Obama Immigration Action Full Speed Ahead The 114th: CQ Roll Call&apos;s Guide to the New Congress Get breaking news alerts and more from Roll Call in your inbox or on your iPhone.